Ship wheels are classic symbols that have long-been associated with seamanship. Along with perhaps the anchor, a ship wheel is a quintessential symbol that implies some sort of association with the sea, a boat, or a nautical theme. And now, you can possess your own ship wheel to be used as nautical decoration wherever you should choose. Our ship wheels come in a variety of sizes and, surprisingly enough, functions. We do have a number of small, functional items that feature ship wheel decorations, like bottle openers that are equally at home in the kitchen as they are on a boat. But most of our ship wheels are nothing short of grand nautical decorations. Made from quality hardwood that is traditionally used for ship building, our nautical decor ship wheels are great items that look as good decorating your nautically-themed rooms as they would at the helm of a ship. As a decoration, our ship wheels are fantastic for offices and sitting rooms, either hung up on the walls for all to see or propped up in the corner and tastefully accentuated to appear like a spare ship wheel that is just waiting to be used. And they come in all manner of sizes, so whether you need a small ship wheel for a small foot-long space or an absolutely gargantuan ship wheel that fills approximately 5 feet of space, we can provide. If you find yourself in need of a nautical symbol to hang on your walls or just a big accessory to remind you of a big ship, then you have found those very things in our ship wheels. 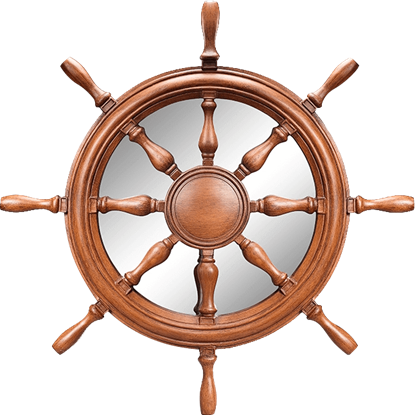 Add a nautical twist to your home with the help of the Ships Wheel Mirror! This maritime wall mirror looks as if it came off of a real ships helm with its cylindrical spokes shaped like balusters that join at the central hub. Our Wooden 12-Inch Ship Wheel is a top-quality item, the likes of which could be as easily imagined at the helm of a ship as easily as it decorates a wall and adds nautical flair to any room it graces. 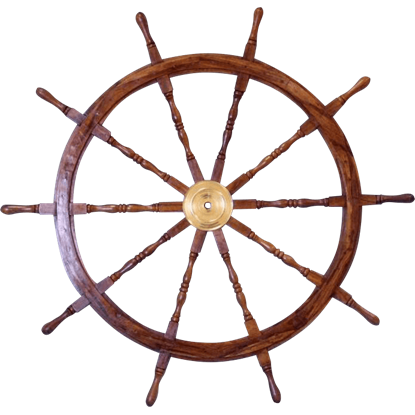 Our Wooden 15-Inch Ship Wheel is a top quality item, the likes of which could be as easily imagined at the helm of a ship as a wall in your home. It adds nautical flair and charm to any room it graces. 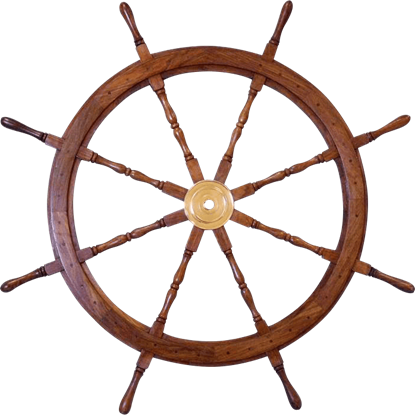 Our Wooden 24-Inch Ship Wheel is a quality item, the likes of which could be as easily imagined at the helm of a ship as easily as it decorates a wall and adds nautical flair to any room, making it great for pirates and boat enthusiasts. 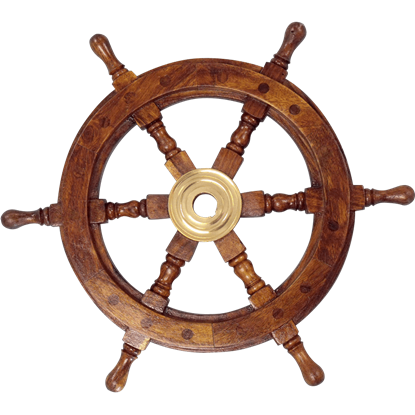 Our Wooden 36-Inch Ship Wheel is a high quality item, the likes of which could be imagined at the helm of a ship or on a wall. It adds nautical flair to any room it graces in your home, making it a must for those who love the sea. 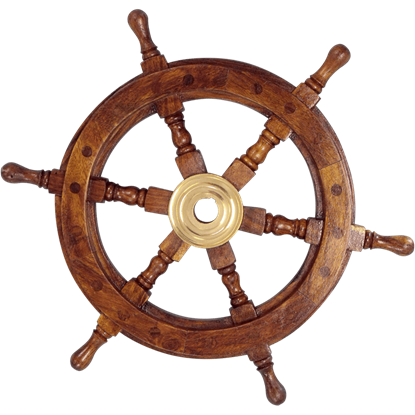 Our Wooden 48-Inch Ship Wheel is an item of excellent quality, the likes of which could be imagined at the helm of a ship or on a wall. It provides nautical flair your boat or home, making this a fine decorative piece. Our Wooden 60-Inch Ship Wheel is a top-quality item, the likes of which could be visualized at the helm of a ship or on a wall. Any room of your home looks great with this piece of nautical decor hanging on the walls. A great BIG thank you to the ladies and all involved. I can't believe how fast it got here. Well packaged. My son will be so happy!